Limited time only! 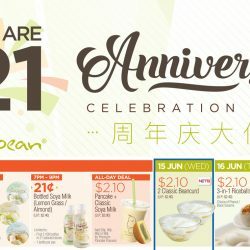 Mr Bean: 1-for-1 Pearly Soya Milk for only $2.40! 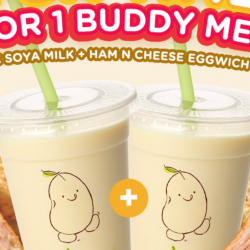 Enjoy 1-for-1 Pearly Soya Milk for only $2.40 at Mr Bean with this Qoo10 deal! Valid for a limited time only specially for 12.12 sale, while stocks last. Redemption period is from 10 to 23 Dec 2018 between 11am to 8pm daily. 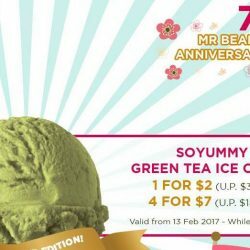 While stocks last Mr Bean: Save up to $7 on SOYummy Green Tea Ice Cream + Get a FREE Mr Bean Merchandise! Who says the best green tea ice cream can only be found in Japan? Now you can chill with bliss with Mr Bean SOYummy Green Tea Ice Cream made with PREMIUM Japanese Soy Milk Cream. A great alternative for ice cream lovers looking for dairy and egg free sweet treats! Not to mention that Mr Bean SOYummy Green Tea Ice Cream is lower in fat content compared to other dairy ice cream! 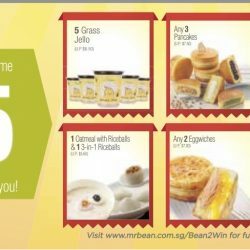 Purchase 4 cups of SOYummy Green Tea Ice Cream and received a FREE Mr Bean merchandise! Get your phones and download Mr Bean SG mobile app now! To celebrate their 50k FB follower milestone, NETS has partnered with Mr Bean for some awesome treats this Wednesday! Simply flash this post at a participating Mr Bean Singapore outlet from 11am to 1pm on 11 January 2017 to redeem one free cup of Classic Soya Milk! 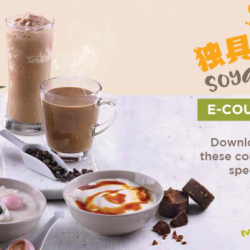 Plus, enjoy a set of Classic Soya Milk with a Pancake of your choice at just $2 when you pay with NETS or NETS FlashPay. Bean It to Win It with Mr Bean’s $5 Combo Deals and stand a chance to bring home the Grand Prize of $2888 or the weekly prizes - 21x Amount Spent or Mr Bean Giant plush! Enjoy additional $1 OFF with min. $5 spend when you pay by NETS with UOB Cards! 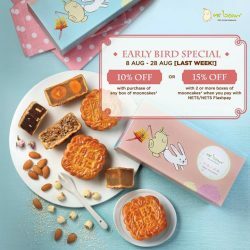 It's the last week to enjoy Early Bird special on Mr Bean mooncakes! Get your Mr Bean mooncake before 28 Aug and enjoy 10% off with purchase of any box of regular-priced mooncakes! Save MORE when you pay by NETS/NETS Special (details below)! Happy Birthday to Mr Bean! Celebrate Mr Bean's 21st birthday by indulging in the following 21-cent deals & MORE! 12PM-2PM: Soyummy Dairy-free Ice Cream at 21 cents (U.P. 4.90)! 7PM-9PM: Bottled Soya Milk (Lemon Grass/Almond) at 21 cents (U.P. : $2.40)! 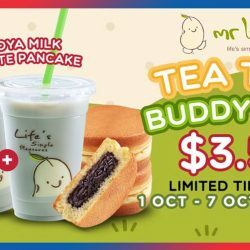 All-day deal: Pancake + Classic Soya Milk combo at $2.10 (U.P. $3.00)! 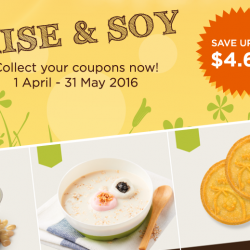 TIll 31 May 2016 Mr Bean: Save up to $4.60 with Coupon Deals! Have you GOT-ten your CHEESE pancakes? 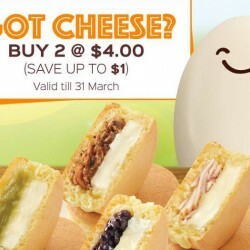 From now till 31 March, grab any 2 of the "Got Cheese?" pancakes at only $4 (Save up to $1)! Hurray! Today’s Soya Milk Day! 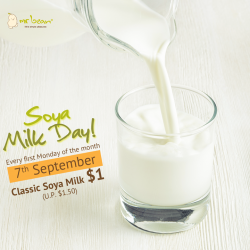 Come down to any Mr Bean outlet to grab your $1 Soya Milk today! With a glass of their healthy and nutritious Classic Soya Milk, you can work at peak performance on a beautiful Monday morning! Mr Bean is back with their amazing Soy Cakes that will sure to satisfy your party need! 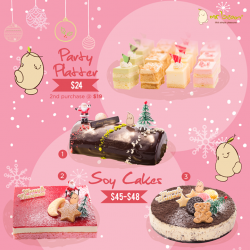 Enjoy their Early Bird Special at 10% off when you pre-order any regular priced Christmas Soy Cake by 6 Dec 2015! To place an order, head down to a Mr Bean store near you to inquire or order online at here. 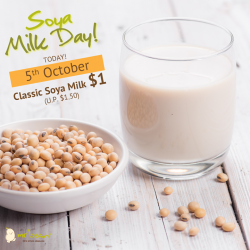 It’s Soya Milk Day today! 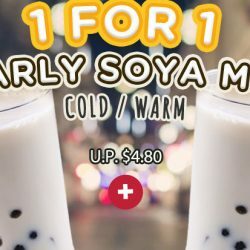 Enjoy their Classic Soya Milk at only $1 (U.P. $1.50). 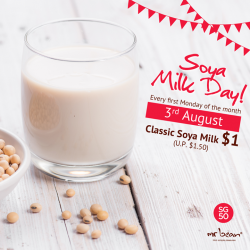 Today Only, grab your nutrient-filled cup of Mr Bean Soya Milk today on the way to work or school! Enriched with protein but without the extra calories, Mr Bean's Soya Milk gives you the best of both worlds! Head down to your nearest Mr Bean store to grab your soya milk today! 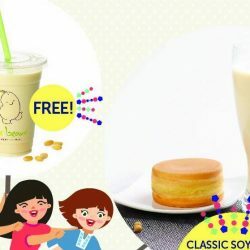 Grab this Mr Bean offers Soya Milk today. 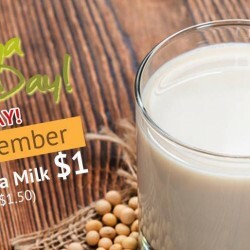 Enjoy our Classic Soya Milk at only $1 (U.P. $1.50). Grab your nutrient-filled cup of Mr Bean Soya Milk today on the way to work or school. Enriched with amino acids and proteins, Mr Bean Soya Milk is your drink of choice. Head down to your nearest Mr Bean store. Share of box of mooncake from Mr Bean with your family! 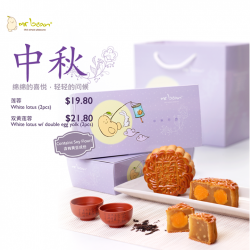 Made from soy flour, Mr Bean's mooncakes are available in two delectable flavours - White Lotus 莲蓉 ([email protected]$19.80) and White Lotus with Double Egg Yolk 双黄莲蓉 ([email protected]$21.80). Limited period only. While stocks last. 50 years of independence for Singapore, 5 days of savings for our fans! 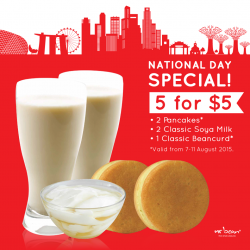 From 7-11 August, enjoy Mr Bean's National Day Special where you can get ALL the following items at $5 only: 2 Pancakes, 2 Classic Soya Milk, 1 Classic Beancurd*. Valid from 7-11 August 2015. Additional top-up required for premium pancake flavours. 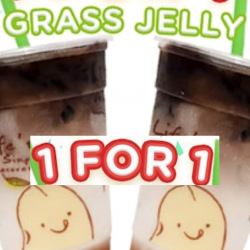 Enjoy this Classic Soya Milk at only $1 (U.P. $1.50).Today only. Be on your way to a healthy lifestyle and grab your nutrient filled cup of Mr Bean Soya Milk! Enriched with amino acids and protein, it is fresh and delicious! Head down to your nearest Mr Bean store to grab your soya milk today! 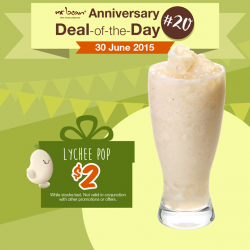 Come and get this refreshing mix of ice blended lychee and soya milk, it’s heavenly on a hot sunny day. Topped with pearls that pop and release a burst of lychee with every bite, it’s simply addictive!Today is the last Deal-of-the-day! Don’t miss it!We hope you’ve enjoyed our deals-of-the-day! 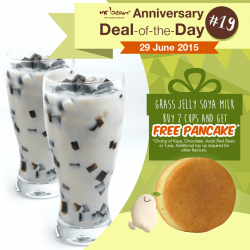 Great for you and your friend; purchase 2 cups of grass jelly soya milk and receive a FREE pancake! Today only. While stocks last! Hurry! 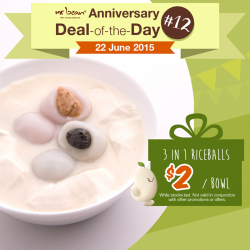 Enjoy and get this Bowl of 3-in-1 Riceballs at $2 Featuring this delicious combination of soya milk, beancurd and peanut/black sesame riceballs. Enjoy this perfect snack with your loved ones and friends today!Stay tuned TOMORROW for the next deal-of-the-day. Alternatively, follow us on @mrbeansg, Instagr.am/mrbeansg to be the first to know what comes. so hurry visit us today! 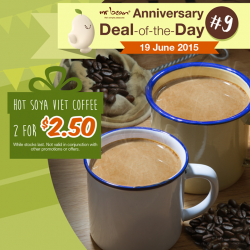 Enjoy and get A cup each for you and your friend, enjoy 2 Hot Soya Viet Coffee (8oz) for $2.50 (U.P $3.20)! *Today Only* so hurry grab your self a great deal today! 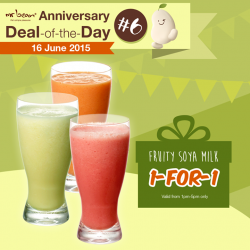 Perfect for you and your friend, grab a 1-for-1 Fruity Soya Milk! Today Only. While stocks last! Fruity soya milk comes in 3 delicious flavours (watermelon, honeymelon and papaya)! Specially made to promote a healthier lifestyle for you working adults, fruity soya milk is enriched with vitamins and fibre, combining the best of soya milk and fruits. Valid from 1pm to 5pm only.